As a young boy herding his family's sheep in a remote area of Navajo land in New Mexico, Eddy Shorty began his sculpture career without even realizing it. "I sometimes found stones that were weathered into interesting shapes reminding me of various animals", he says. "I began to carve little toys for myself out of sandstone in the shapes of horses, sheep and cars." In 1986, Shorty trained at the Institute of American Indian Art in Santa Fe. He says, "I ended up in a sculpture class only when a jewelry class I wanted to take was full. When I began my first piece, I was so excited to see the stone develop in my hands as I had seen it in my mind. Working with stone felt so natural to me. I knew then I had found my life's work." When asked how he approaches a new stone, Shorty explains, "I usually spend time with a stone and make some sketches of it from different angles. 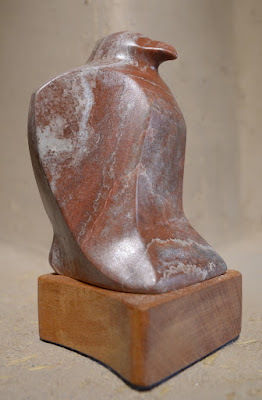 At some point, I will see a form in the stone and then, it is simply a process of revealing that form. Animals or spirit being from Navajo mythology are often what appear in the stone."